With the show now having surpassed the books, tuning in every Sunday has become one big guessing game as to what's going to happen next. I love speculating, and I also love how anything really is possible in both the show and the books. No theory is too farfetched! What's going to happen to Cersei and Loras? In the finale preview, it looks like Loras is going to stand trial before the seven septons. Tommen torpedoed Cersei's plan to have the Mountain fight for her in trial by combat, so what's she going to do? Does it have something to do with that rumor she and Qyburn were talking about a few episodes back? My curiosity has been killing me! Will Daenerys finally set sail for Westeros? She has an army, ships, and three badass dragons. The time seems right. We saw Varys leave Meereen on some mission; will he surface where he did at the end of the last book, A Dance with Dragons? What's next for Bran? The Three-Eyed Raven is gone (and so is Hodor, *sniff* Still not over it. ), so where will Bran go now? I'm also curious if we'll see any more of his vision of young Ned outside the Tower of Joy. Sansa and Jon retook Winterfell, but as Jon says in the preview, they still have lots of enemies. It also looks like Littlefinger tries to collect on sending the Knights of the Vale to help in the battle against Ramsay. Creeper. Arya checked out of the House of Black and White and said she was going home. Does that mean Winterfell, which is totally plausible considering how fast everyone has managed to travel this whole season, lol. Have we heard the last from Dorne? That story line seemed to wrap up early on in the season with Ellaria and the Sand Snakes taking over, but was that really it? I have to say, I'm really not invested in Sam and Gilly's arc at the moment, and I have no idea how they're going to figure into the finale, if at all. Now this arc, I am utterly invested in: the Riverlands. The Freys, the Brotherhood Without Banners, and the Hound are all back. From the preview, Jaime is at the Twins, and Walder Frey looks to be celebrating retaking Riverrun. 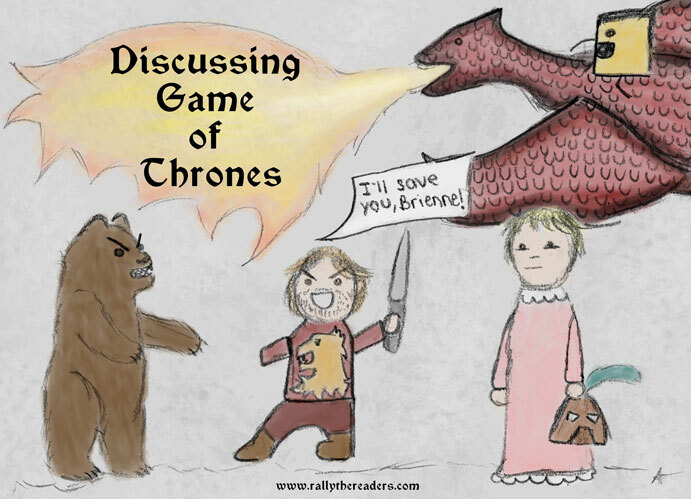 Brienne and Pod are likely still around. What does this mean?! Every time I watch that clip where Walder Frey says, "The Freys and the Lannisters send their regards," I think of the Red Wedding. Is there going to be another massacre at the Twins, with the Freys on the wrong side of it this time? How awesome of a finale would this be if, like, Lady Stoneheart waltzed through the doors with the Brotherhood? OK, that's a lot of wishful thinking on my part, lol, but . . . how awesome would it be?! I find it very intriguing that Beric and Thoros have returned after quite a long absence. Or maybe Brienne will have a run-in with Stoneheart, like in the books? Whew—that's no small number of story lines that are out there, and even with an extended finale, are they all going to fit in the episode? How are you guys feeling about the season finale—thoughts? Theories? I know! 10 weeks already?? Crazy. I like your speculations. I think something big is going to go down in Kings Landing- and I have an idea what the rumor is, but don't want to spoil anything. You probably already know. Will Loras bite it? I do think we'll see the Tower of Joy- I read on a fansite that they are going to finish that vision, so we will apparently see inside the Tower. I think Dorne might ally with Dany so maybe she'll show up there? Sam and Gilly I can't figure out either. I'm with you on the Riverlands- I want to see a lot of action there, and Stoneheart showing up would be AWESOME. I like the BWB and do hope they get some retribution on the freys. They could be using this opportunity to get Jaime and Brienne in front of Stoneheat. And the big question- will the Wall come down? That is a really good question! If that happens, and we have some *ahem* fireworks in King's Landing, I don't know if my brain will be able to process all of it at once, lol. I'm so glad you mentioned Daenerys and Dorne because I was thinking the same thing! :D Dorne hates the Lannisters, and Daenerys has already shown a lot of enthusiasm for a woman being in power with her deal with Yara. So Daenerys arriving at a similar agreement with the ladies of Dorne makes a lot of sense. I need something BIG to happen in the Riverlands, lol. Even if Stoneheart is a no-show, it's about time the Freys got what they deserve.